The Sadolin Lineage is that family in Denmark, who - without broken lines - have had the longest term of Vicar-ship in the country - more than 500 years service. The first Sadolin who got a Vicar-ship was appointed in 1470, and the last appointed Vicar retired in the late 1970'ties. The living members of the Sadolin Lineage belongs to the "Younger Branch" ("Yngre Gren"), whos ancestors are Ole Jørgen Sadolin and Louise Emilie Suzette born Marcussen, who is also of lead to the "MacGregor of Inneregny" in Scotland. You can view our entire family in our web-tree at OneTree. Here you will have our ancestor Ole Jørgen Sadolin as focus point, and from him, you are able to view all members of the family (who is registred in our database). Ole Jørgen Sadolin and his wife Louise Suzette Emilie Marcussen had eight children; five sons and three daughters (one daughter was did not get married and had no childen, another daughter died as a teenager, and a third daughter died when she was born). Today (2004) we are nearly 300 people whom are descendant to Ole Jørgen and Louise Sadolin, and here you can see all the descendants. 7th. Generation (12th. Generation) - Ole Jørgen Sadolin, Vicar in Fredensborg and later Valløby og Reerslev (1826-1908). 8th. Generation (13th. Generation) - Gunnar Asgeir Sadolin (1894-1955), Artist, Managing Director and Executive Deputy Chairman of the Board of the Directors of Sadolin & Holmblad Ltd. and Kemisk Vaerk Koege Ltd.
8th. Generation (13th. Generation) - Knud Sadolin (1880-1960), M.Sc. (Engineering), Managing Director and Executive Director of the Board of Directors of Sadolin & Holmblad Ltd. and Kemisk Vaerk Koege Ltd.
And if we followed the Scottish clan rules, then Pelle Sadolin would be the Sadolin Famliy's "Chief". If you want to view the generations before the 6th. Generation, see the "Old Branches". 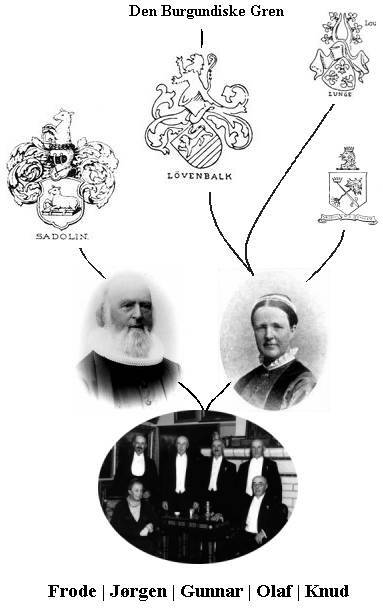 And you can also view our our family relations to The Burundiske Gren, the MacGregor's and the Løvenbalk's. (All these pages are part of our Danish website - and is in Danish, but it is quit easy to see the generations there). If you are connected by family relations to the Sadolin Lineage, and you want your family added to the web-tree, please contact Nikolaj Sadolin, who is in-charge of the Sadolin Family's genealogical forum.